PRODUCT DESCRIPTION: These are thin, cardboard pad like traps with interior "gluey" walls designed to catch foraging centipedes, crickets, blind snakes, frogs, lizards, roaches, salamanders, scorpions, skinks, toads and other pests. They are pre-formed to fold up into triangular shapes and are ideal for indoor placements. Included are small pill like "tablets" that need to be applied to the glue inside each "trap". These pills are essentially the lure so use some at each set. You may set them out in their full size which is shown on the left side of the photo. This is suggested when dealing with large targets. However, you can make them smaller if desired and turn one large trap into one medium and one small trap or three small traps of equal size. Each large trap is "perforated" enabling it to be torn down into two or three traps (shown as 3 traps in the photo). Each large trap comes with at least 3 "tablets" (a 15 Pack of traps has at least 45 tablets) so there is plenty of included bait lure for any trap configuration you choose to use. The included tablet will release a slight smell (only detectable by insects) which helps to attract pests first to the trap and then inside. These are great tools for monitoring local pest activity and can help you identify "hot spots" where target pests are either entering the home or concentrated and nesting. Once these areas are identified, these areas should be treated as explained in our pest control articles. WHERE TO USE THEM: In the home or any building where nuisance pests are observed. Simply set them out along the baseboard, counter top, shelf, floor, bookcase, around door frames, windows or any other area where you're seeing target pests forage. The glue, bait and pheromones are all completely harmless to people and pets so there is no hazard associated with their use in food areas, closets, bedrooms and living rooms. RATE OF APPLICATION: Try to make trap placements every 5-10 feet in rooms which have activity. Monitor them daily to see which ones are catching the most nuisance pests. Replace traps when they get filled, if the glue inside dries (which can happen in extreme arid conditions in less than 2 months) or after 3 months of service. as I know more lizards will find a way in by my sliding doors. Your gecko glue traps are fabulous. THEY WORK! There is NO product like this in Hawaii and we have small lizards and geckos big time. I have looked for anything to kill geckos for over 40 years now. Market your product to CVS Pharmacy, Home Depot, City Mill in Hawaii. There is a HUGE market here….untapped. Thanks for the feedback; no doubt these traps are highly effective for catching unwanted geckos. Great. Was very happy with the products. Do these traps kill the skink? I'd rather let them go. We live in Arizona and this is the first time we've had one in the house. Our cat must have found him because I found the released tail when it was still moving slightly. Creepy! Our traps will capture them but not kill them. Basically they get stuck and cannot move but there is no chemical action, etc. Now since they need safe shelter, moisture and food to survive, they will typically die after 2-4 days if left on the board unattended. So if you catch one and release it within 1-2 days, it should survive fine. To release a trapped skink, use vegetable oil. Pour 1/2 to 1 tablespoon of the oil onto any side of the skink which is caught in the glue. Most releases will require 1-2 tablespoons. Once on the glue, rub the oil along the part of the skink which is caught while gently applying some pressure. This will cause the glue to slowly release the skink as the oil permeates the bond. Generally within 1-2 minutes, the attached areas will come free. One word of caution: be sure to do this where you want to release the skink back into the wild. In other words, don't apply the oil while inside your home because once it knows its loose, it will run! These glue strips worked really good. We were having a problem with many Lizards getting too comfortable on our patio (Like sun bathing right on my patio couch cushions). Well we put the glue strips down & in just a few days we caught them. It was very easy for my husband to carefully remove them from the glue strip & release them else where. They were not harmed. You get plenty of strips as well. YES we will surely order again…oh yeah…we also caught many other little pesty bugs too. Lizards beware! 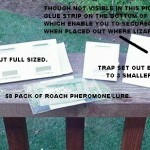 After I received the product, I placed two traps outside on my back patio. The next day I had 2 curly tail lizards captured in each of the traps. I put out another trap the next day and once again I captured another large curly tail. I love the product and will certainly recommend this product to others. Very easy to prepare the traps. Awesome! Package arrived promptly on the expected day. 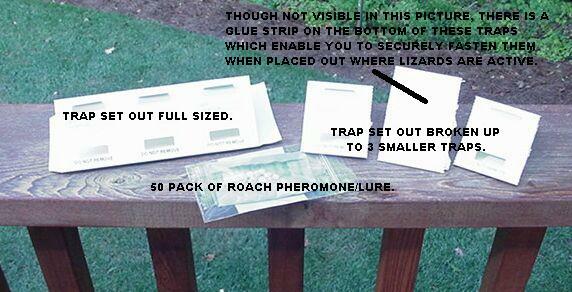 In addition to the lizards – the traps work for catching ants and roaches. Great product! These lizard traps work great. I caught almost 20 lizards in the first few days, with only two escapes. They catch bugs also which works good as bait. Pretty good so far. We deployed these traps in our apartment about a week ago and haven't caught much. That said, our apartment doesn't normally have a ton of creepy-crawlies. After buying the traps, it was comforting to me to see these traps in use as I was in other businesses around town. Apparently these glue traps are very popular. The price is right. Why not give them a try? Absolutely amazing. In order to save money and extend the product, I cut them in half. Within 24 hours I caught 1 anole and 1 palmetto bug, both of which had eluded me for a week. This is a great product. We have used this product for lizards the past several years. It is effective and does not create the mess and smell that other insect control devices have. The company offers prompt shipping and quick arrival. This trap really does work! We bought the 15/pack and have used 14 so far in about a week. Every one has caught at least 1 skink and 1 trap caught a small snake as well. They have also picked up spiders, moths, and other crawly creatures. Traps came quickly as well. I would definitely recommend this product. Worked ideally! I've had a problem with a skink that had moved into a farm house; he could really upset people that were not expecting such a thing to come out from under a sofa. I ordered the sticky traps and put a few out; took about 3 days but my problem was solved. Would definitely recommend to anyone else facing such an issue. I had doubts about this product even after reading the reviews. Several times I have found skinks inside my home. I know they are beneficial but trapping them with a modified water bottle gave no results. So I purchased this product to give it a chance. So far I have trapped about 10 skinks and one sparrow with more come. Great product, worth the money! This Is the Real Deal! I live in a rural insect and pest prone environment and use a general outside perimeter spray in conjunction with these traps. I place my traps strategically around my home to serve as both a primary and secondary line of defense. These traps are simply awesome and catch literally everything that walks, crawls, slithers, and in some cases even fly should they elect to land and investigate. Works Great! I had a problem with 5 Line Skink lizards in my garage. I trapped two so far and think they are the last. I started with a 3-unit trap and went down to 2-unit traps. Now I have one on either side of the garage door where (I believe) they entered. Keeping an eye out now. Only con is the food packaging. It is thin so I transferred contents to old pill container. We were plagued with spider crickets for several years. Spreading around granular bait helped, but these little traps let you see first hand how many spider crickets are caught. And there were plenty! Very pleased with its effectiveness. Thank you! Florida gecko got into my laundry room. I trapped him in until your traps arrived. I did laundry in hopes he'd come out. He did. Within a short time he took the bait and got stuck in the sticky pad. These things are great! Thank you! Finally Caught an Alligator Lizard after Two Months! We had an alligator lizard living under our refrigerator and kitchen appliances for two months. I have owned lizards before and recognized the droppings (we also had some others sneak in before). Its a cold season, so he was happy to scavenge around our house and stay in his new home, we were not. After purchasing the glue trap, within hours it had drawn him out (with some cereal as bait). Within 24 hours after that he had been caught with another baited trap. After a short vegetable oil bath, the guy was released back into the wild. These traps work!